We made it to Illinois, but no farther today. We began with breakfast with Peter and Maren at the local cafe; Peter picked up the tab when we weren't looking. The Helms also gave us a farewell gift of some of our favorite crackers and bananas, and we gave them the last can of beer. 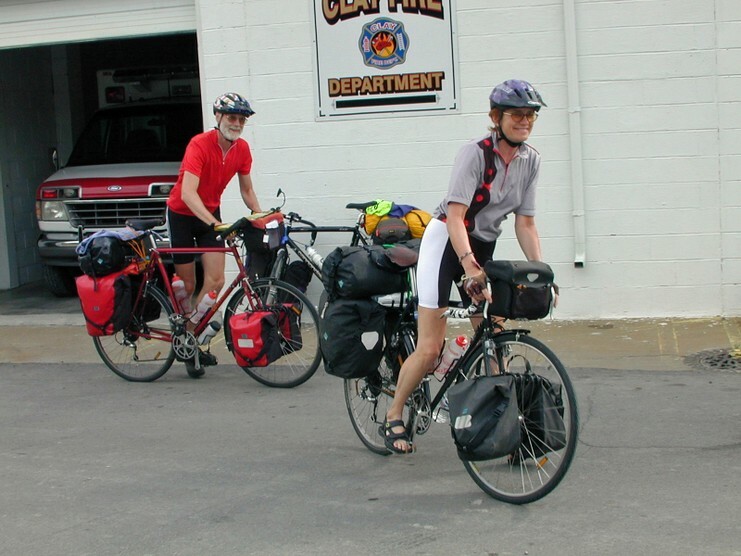 Everyone exchanged addresses, hugs, and wishes for a safe journey, then Peter and Maren took off ahead of us for a motel in Marion, where they intended to stay for a few nights to take a rest day. They have been very good travel companions, and we hope we might see them again. It was emotional to say good-bye. It was after 10 am when we finally left Clay. 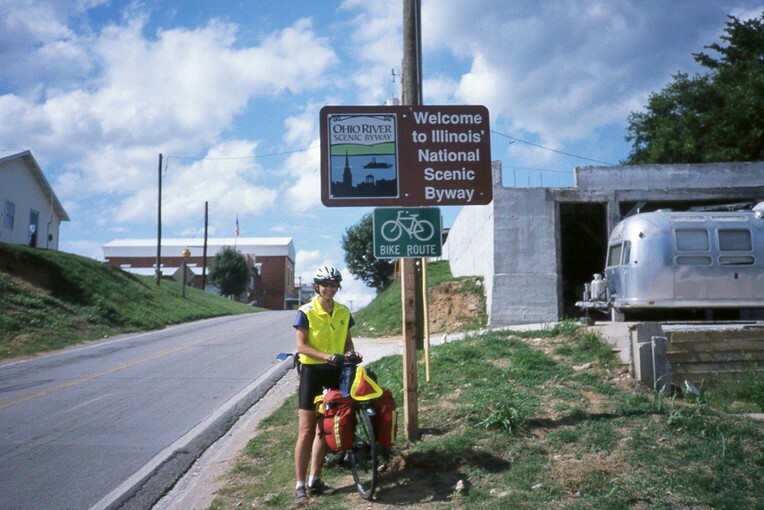 As we pedaled toward Illinois, we wondered if the headwind would blow us back to Virginia. The farther west we went, the more ominous the weather appeared. 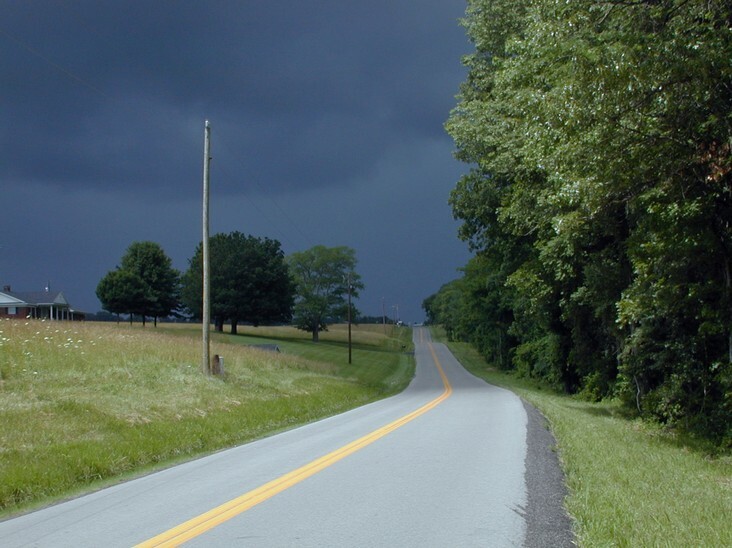 Suddenly our concern turned to alarm as the sky darkened to an inky gray and a cloud shadow raced toward us down the road with a visible rain front close behind. We barely had time to pull out our rain jackets and get our bikes under the trees when it hit. "Ut-oh!" This storm front raced down the road toward us at about 20 mph or more, with the rain following it in the distance. We made a run for the shelter of a farmhouse carport down the road but were still soaked. It took about half an hour for the rain, thunder, and lightening to move on. When it did, blue sky returned, and the landscape was fresh and clean again. We took a detour through Amish farm land on the way to the Ohio River. 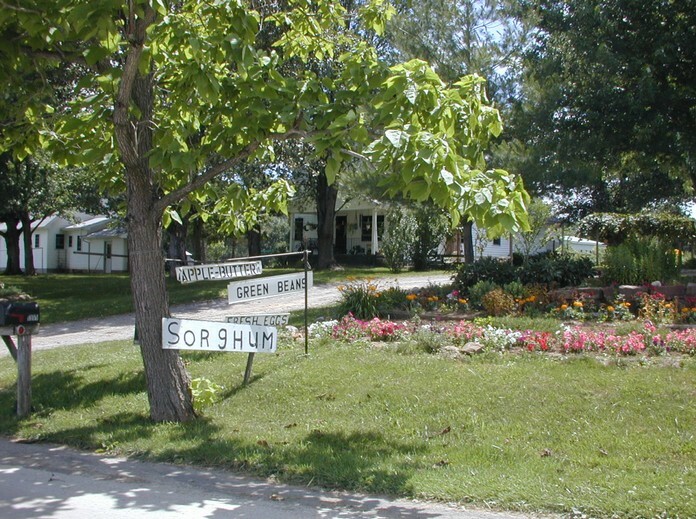 This road is closed on Sundays for the Amish. 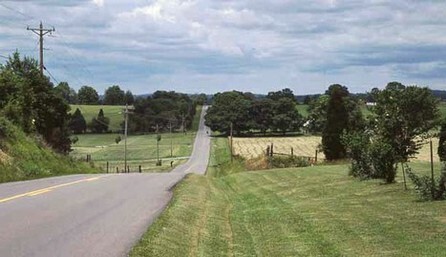 The asphalt down the center of each lane is pitted and scratched from the horseshoes of the Amish draft horses. An Amish woman waved at us, and two Amish men in a hay wagon pulled by two big draft horses waited patiently for us to pass so they could clop down the road behind us. Out of courtesy, we did not aim the camera at them. We found that while we were cycling this peaceful route, our pace relaxed and the stress of making good time or worrying about traffic lifted. 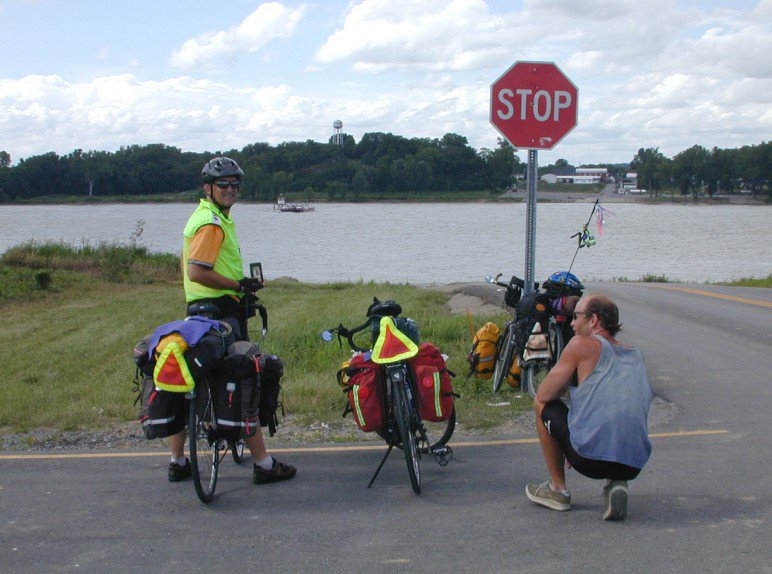 Looking over the Ohio River to Illinois, waiting for the ferry. 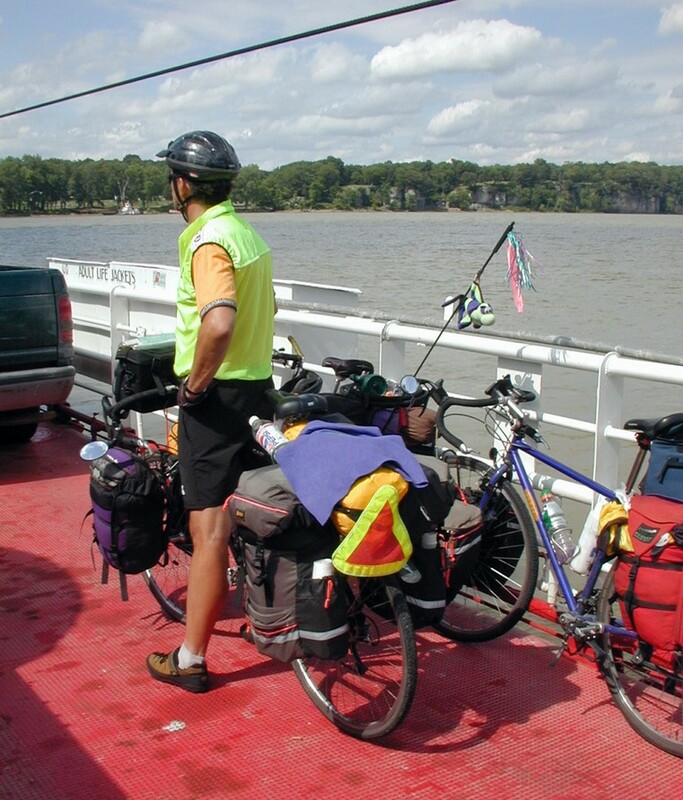 The third touring bike belongs to Donald from Quebec City, who is going our way and whose path has crossed ours many times. When we crossed the Ohio River to Illinois, another storm front blew in and we ducked under the shelter of a picnic pavilion at Cave-in-Rock State Park just as the rain poured down. When it subsided, we saw a man walking toward us, obviously trying to communicate something. Just as we had when first approached by Peter Helm, we were a little confused, until he showed us his bicyclist tan lines. Ah, another bicycle tourist! His name was John Poole and he and his wife Karen were sharing a camp site with Ben, all of them cycling the TransAm route west to east. They were making about twice the daily mileage we have been making. We decided to spend the night at the campground too, where the showers were great. We all went out to dinner at the park Lodge, where the company was much better than the food, and talked about those things of interest to bicycle tourists: hills, dogs, places to stay, and anything else of humor or interest that has occurred to us on our bicycle journey so far.